Formed in 1990 by leader/drummer, Joe Lirette, Le Band Passe Partout set out to acquire a special sound, something unique that would attract young and old alike. “There were just too many Cajun bands out there, doing the same old thing,” said Lirette. “We wanted to be the band that people would remember.” This positive attitude and distinctive new sound was the key that would attract the attention of record producer Floyd Soileau of Swallow Records. Three albums were released on the Swallow label by Le Band Passe Partout over their career. Their first, in 1992, was the recording “Louisiana Cajun Music,” which was re-released on CD in 2007. 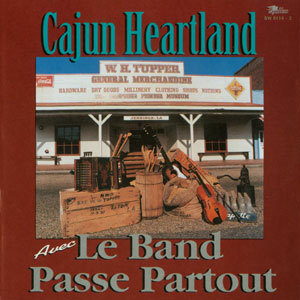 It was followed up by “Cajun Sentiment” and “Cajun Heartland.” Each album topped the previous in sales and appeal and have earned the group numerous awards from the C.F.M.A. including Album of the Year, Best Song, Best Male Vocal, Songwriter of the Year and Single of the Year. 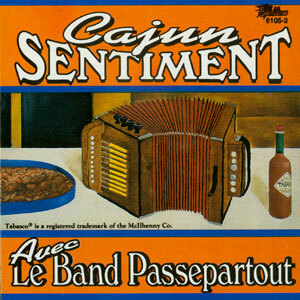 In 1994, “Cajun Sentiment” was placed on the preliminary list for the Grammy nomination in the Best Traditional Folk category and won a C.F.M.A. nomination for Band of the Year, the most sought after honor in Cajun music. For reasons I’ll get to later, I thought I’d revisit the world of Cajun music for this review, spotlighting a newly released album on the Swallow label (Flat Town Music). 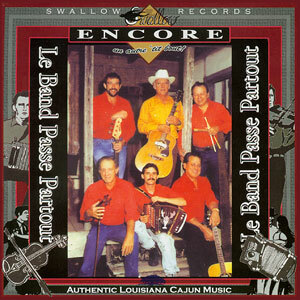 It’s actually a reissue of the debut album for Le Band Passe Partout, an authentic group straight from the bayou, and it’s simply titled Louisiana Cajun Music. The band’s leader (and founder), drummer Joe Lirette, was emphatic about his goal to produce something a little different when the group was formed in 1990. “We wanted to be the band that people remember.” To help hit his target he recruited some solid musicians, including guitarist Robert Elkins and Blake Mouton, who specializes in an instrument that’s mandatory for a Cajun group – the accordion. They found some success for a while. This album was the first of three that the group eventually generated. The others were Cajun Sentiment and Cajun Heartland, which are both still available. However, over the last decade it appears that the guys have gone their separate ways. But there’s nothing wrong with the quality of the music here, and it’s typical of the best of Cajun dance hall music. I especially enjoyed “Valse A Molitar (Molitar’s Waltz,” a piece that shows off the full spectrum of Cajun instrumentation, and “Amadee Two-Step,” a bouncy, ripping good time of a song, with a strong vocal by Elkins. I got a kick out of the mix of songs provided, which range all the way from “Je Suis Toute Pour Toi (I Am All Yours – Cajun Wedding Song),” to the tune that provides the special reason for this review that I mentioned earlier. It’s the last track on the album and it’s a Cajun Christmas song, which is certainly a first for me. “Notre Premier Jour De Noel (Our First Christmas Day)” kicks up the holiday mood for any listener – although it would help if you’re Cajun, or at least speak French.